For those of us living where there are four seasons, we are happy when the winter comes to liberate us from the arduous task of lawn mowing. When spring comes with our grass usually needing its first mow around the middle of April, we either take out last year’s mower or look to find another best lawn mower again. You will want the best grass mower for steep slopes, a grass cutting zero-turn mower, and maybe you want the best grass catching mowers available. If you have a tiny area of grass such as in an apartment or condo home that you are responsible for cutting, a push mower will do the job quickly. The new robotic mowers are all the rage these days for cutting up to one-fourth acre of grass. These are maintenance-free and you do nothing but watch them cut the grass. 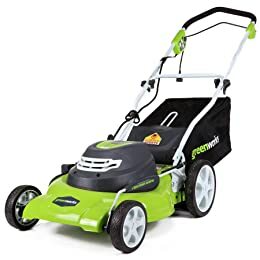 Whether you use a manual push lawn mower like the one in the picture, or a power mower, you will want a good unit to be functional with low maintenance at an affordable price. Walk-behind hand-push reel mowers are usually priced under $100 with cordless battery-powered or gasoline-powered rotary mowers costing from $200 to $400+ while the robotic mowers are $1000 and up. Riding mowers for that acreage you have behind your house will start at around $2000 and up. Each fall, I replace my mower blade or sharpen it, replace the spark plug and filter, drain the oil and gasoline, and wipe the mower housing down for the winter stored in my garage. That’s the best practice for all lawn mower types. I also wipe from a rag a little WD-40 on the blades to prevent rusting in this high-humidity climate where I live. Find the best lawn mower that’s right by reading the lawn mowers buyer’s guide and lawn mower reviews below. 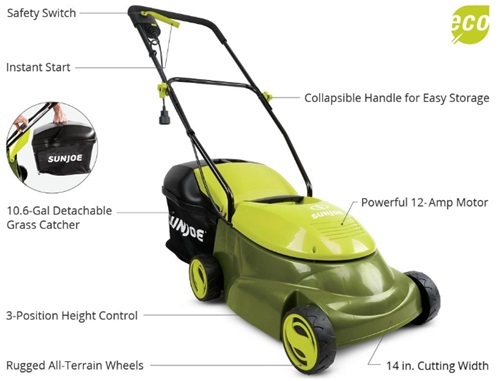 The Greenworks® lawn mower uses a cord for electrical power and not gasoline. It is a top selling favorite on Amazon.com® model number 25022. The deck is made of steel and is 20-inches using a 12-Amp motor. This is not a battery-powered mower. It mulches, discharges the grass to the side, and has a rear bag grass catcher that holds 1.42 bushels (50-liters/13.2-gallons). Push the button to start with no rope to pull as with a gasoline-powered mower. The extension cord is not included yet can be purchased with the mower so that you know you are getting the correct AWG (American Wire Gauge) for operation when you buy the mower on Amazon. When you use an extension cord, the length must be the proper AWG rating or you’ll ruin the motor. For a 50-foot extension cord, use a 12-gauge or heavier; 100-foot use a 14-gauge or heavier. Don’t run over the cord! Start at the side closest to the plug-in receptacle and work away from it. Plug the UL® listed 3-prong grounded cord into a USA 110/120 50/60 Hz outlet. The Wattage is 1200. The mower is lightweight at 56-pounds. You will receive the mower with installation instructions, User’s Manual, and a 4-year Warranty. It is made in China. Lawn mower features and use video. 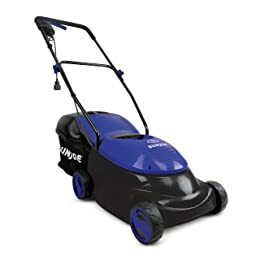 The SunJoe® electric corded lawn mower, model number MJ401E-SJB on Amazon.com®, is available in dark blue, black, green, and red. It will cut your grass lickety-split and is easy to start with its push button. This is not a battery-operated unit nor is it gasoline driven. It uses an extension cord to your A/C receptacle. The height is adjustable to 3-positions from 1.18-inches to 2.52-inches. 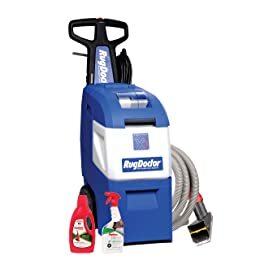 Enjoy the ease in removing the hard-top 10.6-gallon grass catcher to be done with that task quickly without breaking your lower back. Being compact, it takes up less storage space in your garage or backyard storage shed. This mower only weighs 29-pounds and is great in tight spaces and corners. California residents click here for Proposition 65 warning. The mower is Electrical Testing Laboratory®-certified (ETL®) for safety conformance in the USA and Canada. It does not have a chute on the back or sides for grass to discharge if you don’t use the catcher; it clumps on the underside and blade. The spring-loaded door where the grass catcher attaches at the rear stays shut when the catcher is off. You should use the grass catcher to prevent any safety issues and not leave it off the mower. The mower was not designed to run without the catcher. The AWG (American Wire Gauge) extension cord gauge is critical so be sure you get the correct gauge number for your mower. See this extension cord on Amazon.com and do the math for the number of feet you need. If you use the wrong gauge, you will burn out the motor! The recommended extension cord maximum is 100-feet using a minimum rated 14-gauge extension cord. Don’t run over your cord when mowing. It is not self-propelled; if you have 40-degree hills, it will cut if you can push. The deck is made of ABS (Acetyl Butylene Styrene) plastic and will never rust. The steel blade cuts a 14-inch wide swath with each pass. The no-load speed is 3500 RPM, front/rear wheels are 5.5-inches made of plastic, yard size to 1/4-acre or less, and when running the noise level is 92 dB. It does not mulch. The assembled height is 29-inches and the assembled width is 16.5-inches. Gift-wrapping is available to surprise your special someone who needs a mower. It is easy to assemble and comes with a User’s Manual and a full 2-year Warranty. It is made in China. 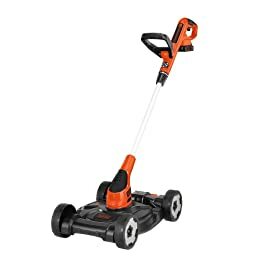 The BLACK+DECKER™ edger/trimmer mows a 12-inch swath that could be all you need mowed in a small lawn space. The model number MTC220 on Amazon.com® is cordless and it is available in a corded model if you like to use an extension cord. The trimmer/edger part detaches from the bottom mower deck to become a separate unit for that task. Then it converts back to a grass mower. The Automatic Feed Spool (AFS®) prevents the bumping we used to do on the ground to release the plastic cutting string. Now you don’t need to do that tiresome interruptive chore. The unit is ideal for an area of 750-square feet. With its POWERDRIVE™ transmission, it will not bog down in heavy overgrowth. The deck is adjustable for height and the handle on the trimmer pivots for being more useful in cumbersome areas. Two lithium-ion 20-Volt max batteries are included to let you use one when working and put the other one on the charger to be ready for you when you need it. It takes about 4-hours to charge a battery, so be sure both are charged before starting to cut grass. If you have a large lawn, you will need a traditional mower. This mower does not have a bag or chute for sending the cut grass out. This unit is more of a “detail” mower to get those nooks and crannies a typical mower cannot get into. The trimmer line size is 0.065-inch. The model number for the Auto-Feed Trimmer Line Spools is AF-100. The mower frame has 2 heights. Plug the 3-prong grounded UL® listed charger into a 110/120-Volt, 50/60 Hz receptacle. It does not work on 220/240-Volts. 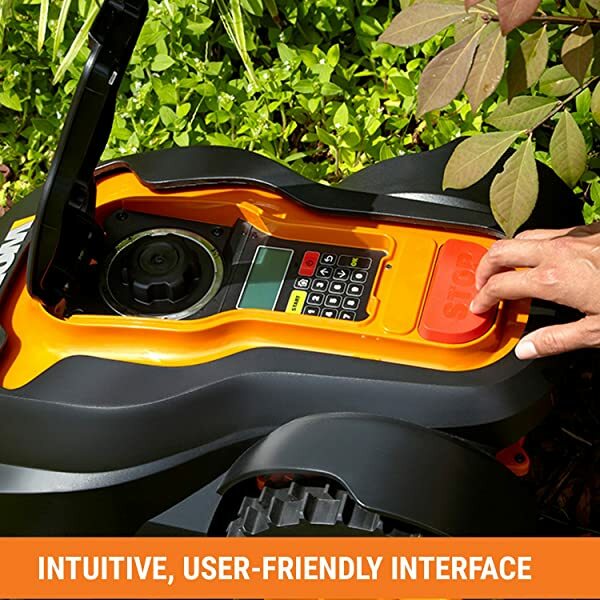 You will receive the edger/trimmer/mower with 2 lithium-ion batteries, charger, spool of string, and a User’s Manual with a 2-year limited Warranty. It is made in China. Black+Decker™ MTC220 12-inch lithium cordless 3-in-1 trimmer edger and mower review video. The Husqvarna® push mower with 160 cc 4-stroke engine type GCV160 is made by Honda®. It kicks out an honest 4.4 HP at 3500 RPM. 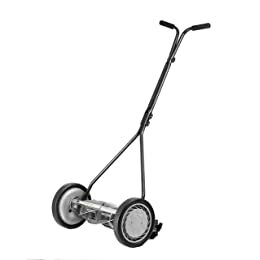 The model number 7021P on Amazon.com® is a push mower and not self-propelled. The cutting deck is steel 21-inch. Big double ball-bearing wheels on the back of mowers are a plus for movement. The rear wheels are 12-inches high and the front wheels are 8-inches. 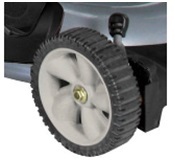 The wheel hubs are HDPE (high density polyethylene) and the treads are a flexible PVC (polyvinyl chloride). This helps to turn the mower on corners. The handle is a soft grip for comfort. This model does not have a deck wash attaching your garden hose as shown in the maintenance video below. The grass clippings will discharge out the side since this is a 3-in-1 system of bag collection on the rear, mulching, or side discharge. The handle folds for easy storage and transporting but is not adjustable for height. The soft bag collects 2.2-cubic feet. 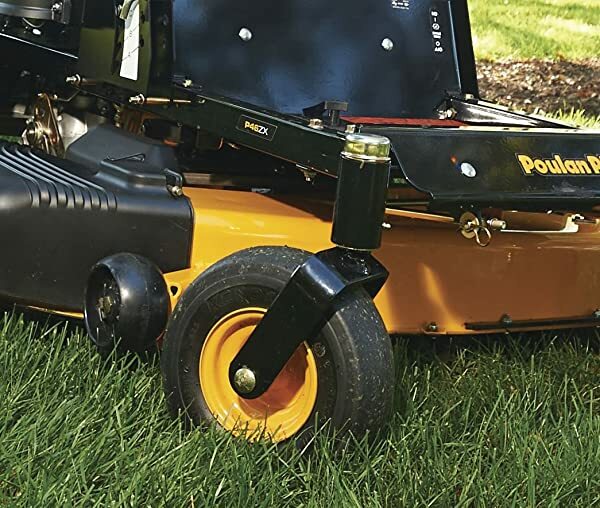 The 7021P also offers 4-point, 9 position cutting height adjustments for varying lawn conditions. There is no throttle control; it is constant speed for the engine. The mower weighs 66-pounds and the wheelbase is 22.25-inches. For those who want to know the cylinder displacement, it is 9.76-cubic inches. The net power at its preset 3000 RPM is 2.9 kW. The engine is air cooled. The gasoline tank holds 0.25 gallons. The cutting height is from 1.25- to 3.42-inches max. It has a separate tank for engine oil and it’s the splash lubrication type. Use SAE 30W regular oil of any brand. The choke is automatic where you don’t have the bulb to push in for gas to go into it to start. You will pull the rope to start it since it has no electric starter that would cost more. There is no assembly required except for a few screws. The air filter is where it belongs so all you need is gas using 87 octane (not with ethanol) and oil to start mowing. The oil capacity is 0.58 quarts (0.55 liters) and a container will be in the box you get. You will receive a User’s Manual and the container of oil. There is no oil or gas in the tanks! The Husqvarna® 3-in-1 lawn mower is manufactured in the USA. The Honda® engine is made in Thailand. Husqvarna® Lawn Mowers – Maintenance video. 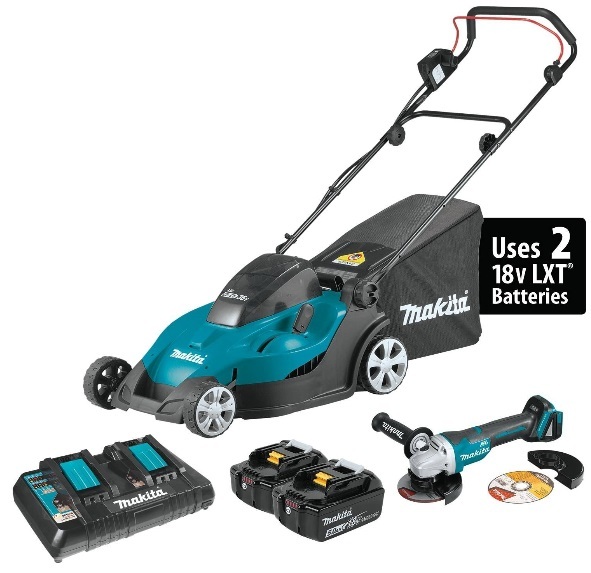 The Makita® cordless lawn mower model XML02Z uses lithium-ion batteries but none comes with the mower nor a charger. “Tool Only” means you get only the mower without the batteries and charger. 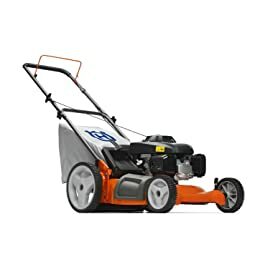 You can, however, buy both with the mower only on Amazon.com where this mower is. The engine speed is 3600 RPM and you will have a lever for adjusting the cutting height from 13/16- to 2-15/16-inches using a lever. The cutting width is 17-inches. The fixed handle position is 40-inches and not adjustable. The grass catcher bag is 13-gallon capacity and comes with the mower. It attaches and detaches easily and quickly. The soft start suppresses start-up reaction for smooth start-ups and longer gear life. You can run the mower for 30-minutes using two each 18-Volt LXT 5.0Ah BL1850 batteries (batteries not included). The kit with batteries and grinder is sold here at $100 more than the bare tool mower. If you want everything included, check the second box under the description on Amazon. The motor is not brushless and there is no chute for grass to discharge out the side. It weighs 40.8-pounds with batteries when installed. The dimensions are 58-3/4-inches long x 18-1/8-inches wide x 37-1/2-inches tall. You will receive a User’s Manual and a 3-year limited Warranty. It is made in China. The Craftsman® in my opinion, is the best push lawn mower ever made! Sears® sold the mower, Kmart® is now a subsidiary of Sears® and now both are going under. I own the 7.5 HP self-propelled rope starting unit that is dark green steel bought in 1998 and it still works as great as the day I bought it from Sears®! It’s no longer available. This is due to annual maintenance and the annual oil change. I replaced the wheels, choke button, and rope once. The button simply dried out living in dry Colorado yet it still worked. It uses 0.2 gallons of unleaded 87 octane gasoline and any brand SAE 30 engine oil. I always change the filter each year and replace the spark plug then too. 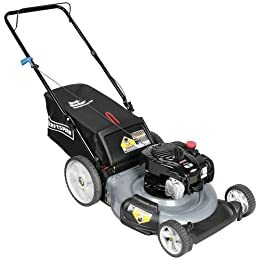 The model 37430 sold on Amazon.com® has a Briggs & Stratton® Silver Series 500e 4-cycle 40cc gasoline-powered engine with OHV (overhead valve) 5.0 foot-pounds of torque to give you high performance in a push mower. The engine is 7.5 HP (horsepower). It has a primer button for quick starting pulling the rope. It cuts like a razor blade and when you remove the grass catcher, it will mulch. The grass bag holds 1.9-bushels of grass and dust to keep it out of your eyes, off the lawn, and in the bag. The height adjusters are on all 4 wheels and you push the tab at the top to move the wheels up or down with its 6 positions. The front wheels are lower at 7-inches with the rear wheels higher at 11-inches for easier maneuverability. With the MRS spark plug, starting is easy and it should be replaced after a year of continual mowing. The handle folds for storage but does not adjust up and down. The deck and handle are steel and the blade is made of alloy steel for strength, the bag is cloth, and the filter is foam. If you don’t want to use the bag grass catcher, the grass comes out the side chute. It will mow 1/3-acre if you don’t get too tired pushing. Take a break and continue as I do. The dimensions are 36.56- x 23.87- x 17.5-inches with a cutting width of 21-inches. The cutting height is from 1.25- to 3.75-inches. It is California carb compliant. The oil reservoir is located at the bottom of the engine opposite the gas tank. It is just a small screw-out type plug. It is not the most convenient location and you will need a small funnel with a long neck to conveniently put oil in the mower. 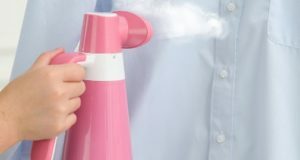 You will receive a User’s Manual with oil in a bag and some assembly is required putting the handle up and tightening. It comes with a 2-year Warranty. It is made in China nowadays. Craftsman® Lawn Mower Disassembly – Lawn Mower Repair Help video. The American Lawn Mower Company™ was established in 1895 from the Victorian era to World War II to the second suburban boom of the 1970s. 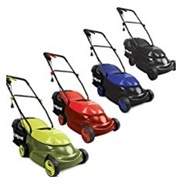 The model number 1415-16 with 5 steel blades on Amazon.com® gets great reviews from small lawn users. 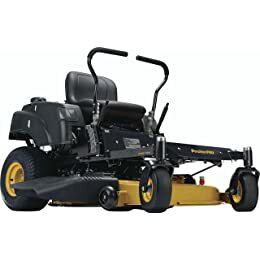 This mower is also available in 14-inch, 4-blade, and 18-inch, 5 blade for the width path you want to best serve your mowing needs. The more blades, the better the cut. With a reel lawn mower, you will have a real workout if you have a large lawn. It is, however, ideal for a small space. 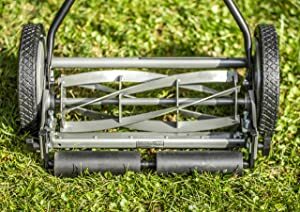 You can keep your small lawn neat and trim with this full featured reel lawn mower with a welded shrub bar to push twigs out of your way. You can adjust the height for the grass tallness you like best. It’s lightweight and uses nothing except your body to get the job done. The 10-inch cast iron wheels have radial tread tires. The ball bearing reel is the 4-spider type. The cushioned flair-style handle is easy on your hands and comfortable rather than having bare metal to blister your palms. Use a few sprays of WD-40 for regular lubrication of the bearings and blades to keep your mower in shipshape mowing condition. The walk-behind reel mower has a cutting length range of 1/2- to 2-1/4-inches. Both the reel and blades are constructed from tempered alloy steel and are held in place by an unbreakable steel plate. The mower weighs 32-pounds with some assembly required. Click here for Proposition 65 warning. The blades only need to be sharpened every 3- to 5-years. The handle does not fold; it’s so small it will stand in a corner or against the garage wall. It’s not a good idea to use this mower in the rain or when grass is wet. Wet grass tears and will ruin your blades whatever mower you own. Plus, all that wet grass must be removed and it turns yellow on the lawn. The back rollers keep the mower upright when you aren’t holding it. The mower rests on the back rollers and is a standard design feature on a push reel mower. The handle remains where you want it instead of falling to the ground. Gift-wrapping is available for loved ones and friends. You will receive a User’s Manual and a 2-year Warranty. The Corporate office is in Indianapolis, Indiana, USA, and the mower is made in China. Great States (is American Lawn Mower®) 16-inch manual reel mower review video. The Troy-Bilt® TB330, item model number 12AKC3A3766, on Amazon.com® is a best-selling self-propelled rear-wheel drive lawn mower that’s very affordable. 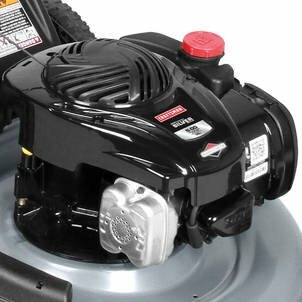 Cut the cord using electric-powered mowers and enjoy this 163 cc Briggs & Stratton® 725Exi Series engine. This is not an electric start model so you will need to pull the rope for the engine to start immediately. It’s around 4 HP. 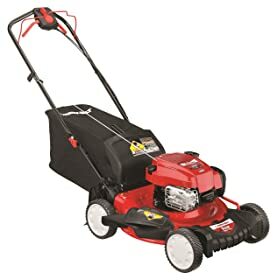 It is called a 3-in-1 mower with single-lever adjustment with the 21-inch deck that features 6 cutting height settings, 3-in-1 mulching capabilities, and exclusive Troy-Bilt® Tri-Action® system for a clean and even cut. The system has a rake bumper to lift grass upright, a specially designed blade for a finer mulch, and a symmetrical deck for superior grass flow, eliminating clumping or patches in your lawn. The recoil ReadyStart™ Choke System means no priming is required. The grass discharges out the right side, it mulches, and has a rear 1.9-bushel grass collection bag that’s easy on easy off. It even has an integrated deck wash!—simply attach your garden hose to clean under the deck removing dead or wet grass from the blade and housing. With its single-lever variable speed drive control you will have 4 speed settings to mow the way you want your lawn grass to look. The front and rear wheels are 8-inches high and the non-adjustable ergo handle makes pushing it more comfortable than without it. It is adjustable up and down. The gasoline tank holds 1.09-quarts of 87 octane unleaded gasoline and the cutting height range is 6 settings from 1.25- to 3.75-inches. Be sure to use oil; included with the mower is a 15-ounce container of SAE 30. The engine is 4-stroke so never mix the oil with the gas! The mower measures 24-inches wide x 38-inches long x 17.5-inches tall and weighs 80-pounds. You’ll receive a User’s Manual and a container of oil with a 3-year Briggs & Stratton® Starting Promise limited Warranty. The mower is made in the USA. The PoulanPRO®, sister company Husqvarna®, is a base model home user mower. 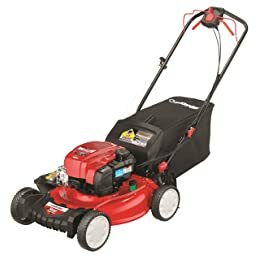 The 967330901P46ZX powerful Briggs & Stratton® Engine V-Twin Pro 22 HP, 22-Volt, 2-cylinder, 46-inch stamped reinforced cutting deck with easy electric clutch blade engagement, and Hydro Gear dual HG EZT transmission makes mowing a large lawn a breeze. The 3.5-gallon gasoline tank makes filling ‘er up less often. You’ll ride in comfort on this best zero-turn-radius mower with the 15-inch extra high back seat. The access panel is easy to get to. The frame is welded, and the cutting height is adjustable from 1.5- to 4-inches. 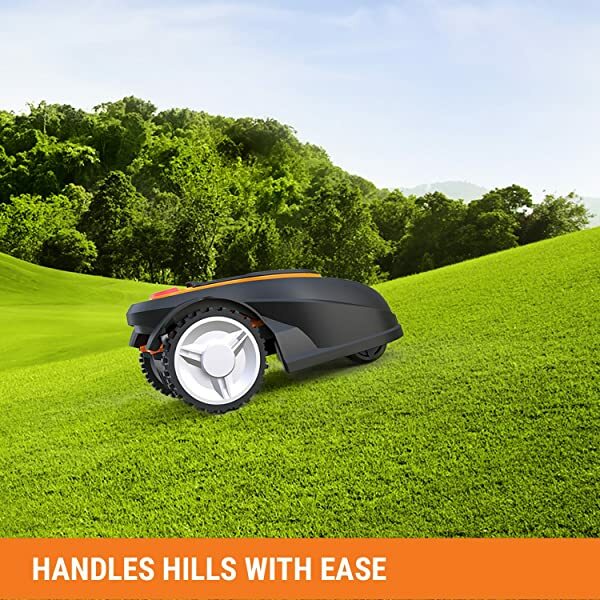 With its durable caster wheels, you will feel secure driving this mower using the dual steering levers with foam padded hand grips. Other features are the digital hour meter, a nose roller, and 3-anti-scalp rollers. It mows when put into reverse. 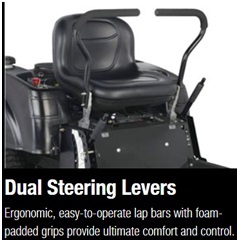 It has a safety device in the seat to shut off the mower when you’re on a slope. Riding mowers should be driven up and down slopes and not across the slope to prevent accidental tipping over. 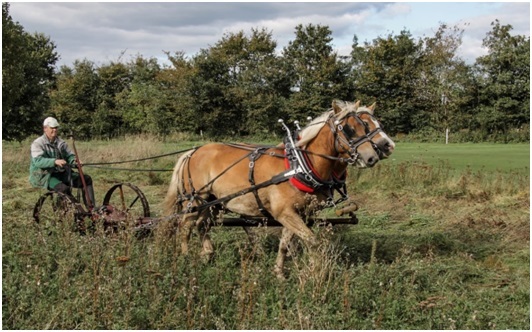 With a top speed of 6 MPH and a large gas tank, you should be able to mow 2.4 acres every hour. That’s a large amount of grass to cut. Engine lubrication type is pressure with oil filter. With its 11-inch front and 18-inch rear tires, you will feel safe and secure. The best riding mower measures 61.5- x 78- x 35.5-inches weighing 750-pounds. One12-Volt battery is required and it’s included with the mower. It is 56-inches wide with the grass chute down and approximately 50-inches wide when you pull it up to fit through gates. The mower does not come with a mulching kit; however, it can be purchased separately. The part number is 525405001. Here is the link to buy on Amazon. The bagging system headlight and armrests and other accessories can be purchased separately as well. Keep your deck spindle greased and it will last for years. Don’t forget to take the ignition key with you so that no one steals your mower or the kids take it for a joy ride. It arrives on a wooden pallet and the nails must be removed with a crowbar with the mower needing some minor assembly. The box needs a signature due to its value so will not be left on your doorstep if you aren’t home. You’ll receive the User’s Manual and a 10-year limited homeowners Warranty. 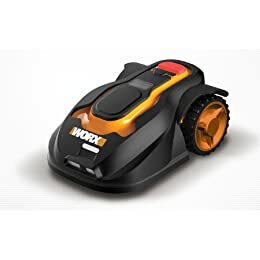 The WORX® Landroid robotic lawn mower was named in Men’s Health magazine on their list of Top 15 Smart Home Devices in 2018. 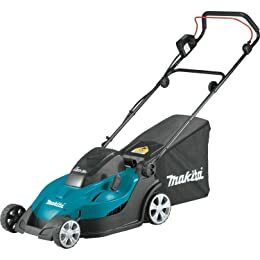 So get one of these mowers for the man in your life on Father’s Day or any day and remember, women will love this too! These robot mowers are very popular in Europe and now catching on in the USA. I don’t know why everyone doesn’t own one. No gasoline, emissions, noise, or maintenance except to sharpen the blades occasionally. It hasn’t been too long ago that the robotic vacuum cleaner came about. I’m hoping they make a unit to wash windows inside and out! Being fully programmed when it arrives, set it up and start using immediately. This mower has a rain sensor and safety shut-off for the model number WG794. It’s no good to have this if you don’t know how to make it work that is easy to do. You will need to place the perimeter wire at your mowing areas and the instructions are excellent for showing you how to do that. The robotic mower makes intricate cuts, knows how to cross a driveway to mow the other side, and traverses narrow spaces. Hills? The Landroid can do inclines/declines up to 20-degrees. And it has a shock sensor to mow around obstacles. Be sure to pick up larger twigs and any big rocks or trash. It will go over thin branches with no problem as well as autumn leaves. Landroid delivers safety and security measures like a tilt/lift shutdown to prevent injuries and a PIN to prevent unauthorized use. You can install a GPS device to prevent theft. When it starts raining or the battery needs recharging, it will automatically return to its base. The cutting height is 1.6- to 4-inches and you can select from 5 positions for mowing up to 1/4-acre. The cutting diameter is 7-inches. The battery is rated at 28-Volts max and the no-load speed is 2800/minute. The unit is lightweight at 20-pounds. You can buy additional 3-inch lawn stakes in a kit for boundary wire installation as well as the 1-inch replacement cutting blades with 12 of them with screws in the kit. Extra boundary wire can be purchased or just buy some hidden dog fence wire. You get the User’s Manual, wire, and stakes with a 3-year Warranty. WORX® headquarters are in North Carolina, USA, and the unit and all of their tools are made by the Positec® Tool Corporation, a manufacturing company, based in Suzhou, China. WORX® Landroid must see robotic lawn mower perimeter wire installation English video (80 cm=31-inches). Read your User’s Manual before doing anything; you’ll be surprised what you’ll learn. Be sure to follow the safety instructions. Click here for Proposition 65 warning if you live in California. Before you start cutting your lawn with a zero-turn-radius (ZTR) mower, be sure you know how to operate it. 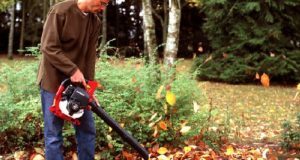 Remove large branches and debris before you start mowing and don’t run over garden hoses or they will be cut. I did it! Keep the kids and pets out of the mowing area. Never ever alter grass discharge chutes, cut off the rubber at the back of a mower that is a safety device on some gas-driven self-propelled mowers where the bag sits. Always wear good shoes and never flip-flops. When you wear shorts, rocks and other debris will hit you. Wear hearing and eye protection. Wear long pants with socks for your shoes to keep chiggers (the red bug), mosquitoes, and other grass living bug biters from getting you. 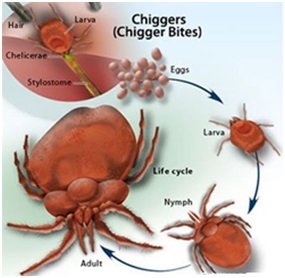 Chigger bites take weeks to stop itching and being red. Never add gasoline or engine oil to hot mowers; let the machine cool down first. Be sure to read your User’s Manual for the challenging job of mowing on slopes. You never want the mower to fall on you that can cause terrible injuries. Wear SPF sun protection on your skin. Keep your feet and hands away from moving parts, especially the blade. Do not have passengers on a riding mower. Always remember to remove the key if your mower uses one. All about extension cords is on Wikipedia here. It is critically important to have the correct AWG (American Wire Gauge) for the length of extension cord to use with the lawn mower you buy. Be sure to click on the yellow extension cord in the picture to the right to read and understand the NEMA numbers. If you use a thin extension cord that you use for your electric lamp with 2-prongs, you’ll burn out your mower motor. Remember, the longer the cord the larger the gauge. Always store your lawn mowers in a dry place out of the weather elements. Use the engine oil recommended in the User’s Manual, usually SAE 30. Never use transmission fluid! How to mow a lawn for beginners and old-timers too video. At the end of the day, it’s all about what you can afford for getting your lawn cutting needs met. 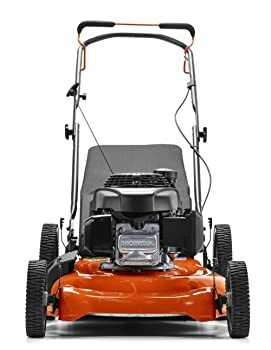 Read customer reviews on Amazon because those buyers will let you know their honest opinion using the mower they bought. Happy shopping! Old McCormick mower of days gone by. I’d sure hate to do it this way on a hot humid day!